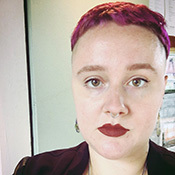 Jesse Rice-Evans (she/her/hers) is a queer femme rhetorician and PhD candidate at the CUNY Graduate Center researching intersections of language, disability, and digital culture. She’s written four books: Soft Switch (Damaged Goods Press, 2016), NOON (dancing girl press, 2018), HONOR//SHAME (Gap Riot Press, 2018), and The Uninhabitable (Sibling Rivalry Press, 2019). She teaches queer texts and composition at the City College of New York.